Situated on the busy crossroads of Traveserrra de Gràcia and Torrent de l’Olla Gràcia Public Library houses an excellent collection of books, magazines, CDs and DVDs. It’s worth calling in to find out what’s going on in the barrio and across the city — with leaflets, free community newspapers and what’s-on guides, with some in English, French, German and Italian. Non-Catalan speaking residents and visitors are made welcome, and you’ll find a good selection of fiction, poetry and language-learning materials in all major European languages. The study area, with free Wi-Fi, is open until 01:00. So, you can take your laptop along, catch up with your email, and when you feel like a coffee, or a beer, put your laptop in a secure locker and stroll across the street to any one of several café-bars nearby. A library card gets you a good range of discounts on admissions to concerts, events, exhibitions, talks, walks and workshops at venues across the city. The staff are all very helpful and very knowledgeable. 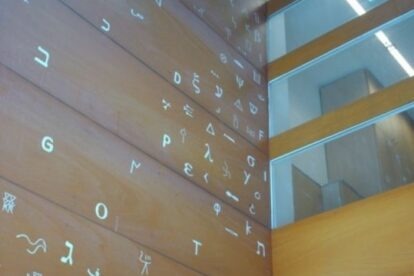 I really appreciate the library’s core philosophy of promoting the written and spoken word as a tool for better understanding – a philosophy which is symbolised by the hieroglyphic, cuneiform, runic and ancient Greek script used in the artwork which decorates the entrance and stairwell. You’ll also find my novel, After Goya here – it was a recommended Summer Read in 2016. You’ll find the library just along the street from the local market.